A rash of inmate deaths in facilities across Mississippi this month has yielded few details in recent weeks, leaving families with no answers, and continued trends at the state’s prisons that have prompted several prison-condition lawsuits. On Monday, officers responded to an altercation between two inmates in their cell at Wilkinson County Correctional Facility, according to a statement from private company MTC, which operates three of the state’s facilities. Medical personnel attempted to revive Nija Syvallus Bonhomme, 24, but were unsuccessful. Bonhomme was sentenced in 2016 to 20 years for armed robbery and residential burglary. That same day, John Luttrell, 67, was pronounced dead at Merit Health Rankin hospital in Brandon, Rankin County Coroner David Ruth told news outlets. Luttrell, who was 32 years into a 70-year-sentence for attempted murder and possession of a weapon by a felon, had been transferred to Central Mississippi Correctional Facility in Pearl on Aug. 10, the Clarion Ledger reported. Those deaths bring the total number of prisoner deaths in the month of August to 10, according to Mississippi Department of Corrections spokesperson Grace Fisher. All of the other reported deaths were of prisoners in the three main, state-managed prisons. Several of the inmates were under the age of 40, and several were serving sentences for non-violent offenses. Officials have said the deaths are unrelated to one another, and that official causes of death are pending autopsies and investigations. More deaths have occurred at Mississippi State Penitentiary at Parchman than any other state facility in Mississippi over the last five years, according to records from the Department of Corrections. And in 2017, Parchman, the state’s largest prison, had a higher mortality rate than the general public; in 2016, the last year the State Department of Health has publicly available data, the overall mortality rate in Mississippi was 1,063.6 deaths per 100,000, compared to 1,337 deaths per 100,000 at Parchman last year. Corrections officials believe most of the 10 deaths for the month of August are from natural causes, based on information readily available at this time, said corrections commissioner Pelicia Hall in a statement. “The MDOC takes very seriously all deaths in its custody and investigates all of them to determine whether foul play is involved,” Hall said. Senate Corrections Committee Chairman Sampson Jackson II, D-Preston, said that the deaths have come to his attention and that he plans to meet with Hall this week to “try to see what’s going on,” he said. “If there’s something we could have done to prevent (the deaths), that’s my concern,” Jackson said in an interview with Mississippi Today. Due to severe understaffing, a backlog at the state’s crime lab that has plagued Mississippi for five years has also left families of the prisoners without answers. Greene County coroner Ladd Pulliam said it could take months to get certified reports on any of the three prisoners who died at South Mississippi Correctional Institution in Leakesville. One of those prisoners was Willie Hollinghead, 36, who died August 4. Family members told Mississippi Today that Hollinghead, who was eight months into a decade-long sentence for selling cocaine in Wayne County, had been healthy when he entered the prison, as far as they knew. Teresa Bennett, the grandmother of Hollinghead’s two children, said officials told her Hollinghead had been found in his bunk unresponsive and that they were unable to resuscitate him. What little information has come to light concerns Daniel Vasquez, a California-based corrections consultant who has worked on death in custody cases before. The Ledger reported that on Aug. 11, Pearl inmate Ricky Martin complained that he could not breathe. A guard went to sleep while Martin and other prisoners called for help, witnesses said, adding that hours later, a defibrillator did not work, according to the newspaper’s report. MDOC has contracted healthcare services to the company Centurion since 2015. 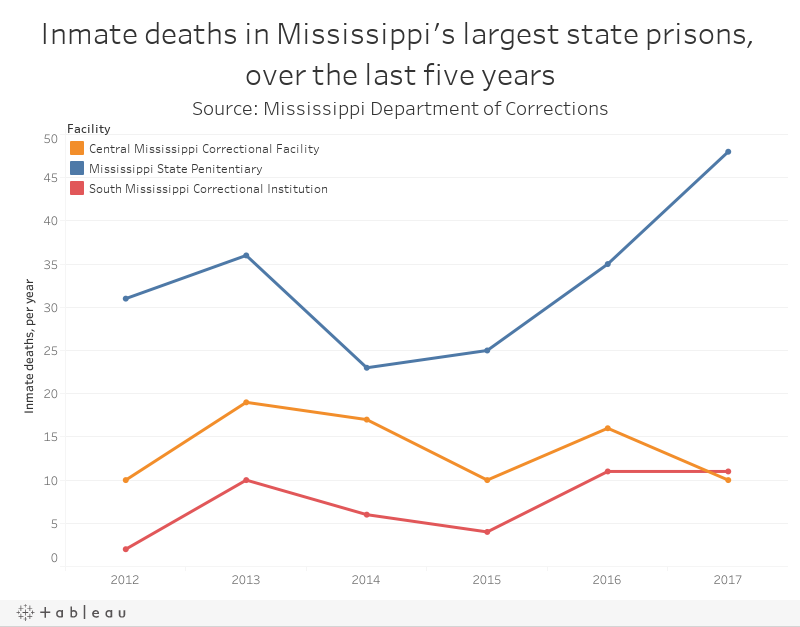 Matthew Naidow, a former corrections officer at East Mississippi Correctional Facility, said a number of factors are at play when a prison system like Mississippi’s sees a sudden series of inmate deaths over a short period of time. Conditions at the prison, which is privately managed, were the subject of a lawsuit that went to trial earlier this year. Problems like underpaid guards, poor medical care, and a mentality toward prisoners that amounts to what Naidow calls “lock them up and throw away the key” creates a perfect storm, he said. In fiscal year 2017, MDOC spent $69.4 million on health care contracts, specialty health care needs and security for hospitalized inmates, according to an state audit. 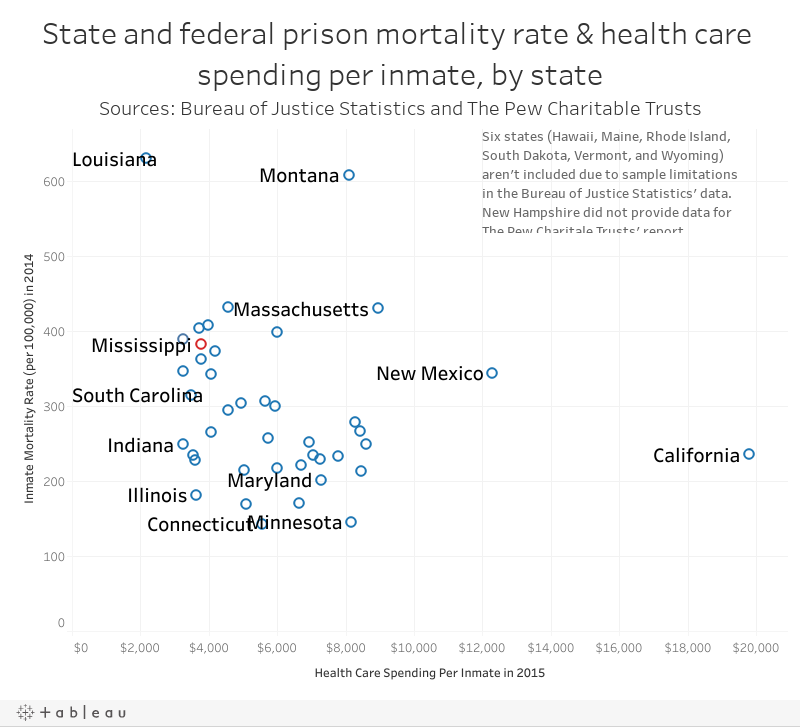 According to a Pew Charitable Trusts report, Mississippi spent $3,770 on health care per inmate in 2015, a seven percent decrease from 2010 and the tenth lowest of the 49 states surveyed. A similar spate of MDOC prisoner deaths in the spring of 2017 drew concerns over whether the department had adequate funds to address the needs of its nearly 20,000 prisoners. Over the last four weeks, at least eleven Mississippi prisoners have died in custody. July 30: Lemario Smoot, 32. Aug. 5: Robert Joseph, 38. Aug. 11: Ricky Martin, 58. Aug. 20: John Luttrell, 67. Aug. 4: Charles R. McCullough, 66. Aug. 15: Lucious Bolton, 29. Aug. 18: James Myrick, 63. Aug. 2: Albert McGee, 57. Aug. 4: Willie Hollinghead, 36. Aug. 5: Jack Glisson, 70. Aug. 20: Nija Syvallus Bonhomme, 24. Southern Poverty Law Center calls on state to reform the health care and reporting practices in the Mississippi prison system.